The ported LS1 cylinder heads that I am installing were first CNC machined and then hand ported by Motorsports Technologies Inc. (MTI). The deck surfaces were milled 0.030" to raise the compression ratio about 1/2 point from the stock 10.0 to 1 to approximately 10.5 to 1. The intake valves were increased in size from the stock 2.00" to 2.055" and the exhaust valves were increased in size from 1.55" to 1.60". These heads flow approximately 300 CFM on the intakes and 210 CFM on the exhaust. 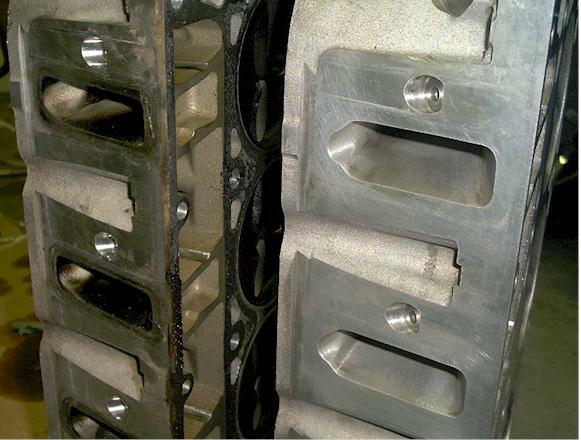 This pic compares the ported intake runners on the right to the stock cylinder head on the left. The installation process went fairly smooth. I had to buy new "torque to yield" head bolts and I also bought GM cylinder head gaskets along with new intake manifold gaskets to ensure zero leaks. Pulling the rear lower cylinder head bolts on the passenger side was a real pain due to the tight clearances next to the heater - A/C shroud. I found the best way to remove the two bottom rear head bolts and re-installing them on this side was to actually remove the motor mount bolt from the passenger side and loosen the driver's side bolt along with removing the rear transmission mount bolts and raising the motor approximately a full 4" on the passenger side for ideal clearance. 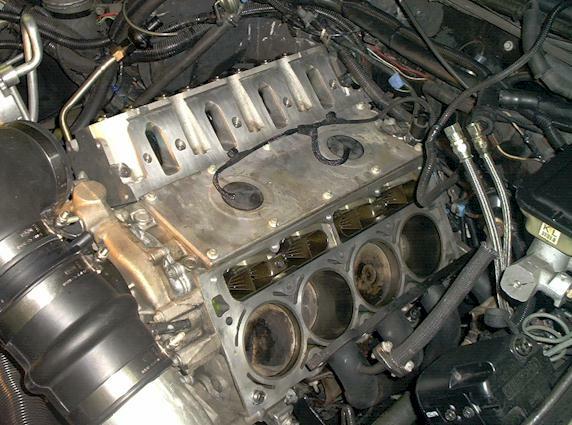 This pic shows the re-installation process with the ported passenger side head reinstalled. I re-dynoed the motor after changing the oil and using LS1_Edit for fine tuning of the air/fuel and timing achieved +33 RWHP and +29 RWTQ bringing the final engine power numbers in at 424 RWHP and 400 RWTQ! 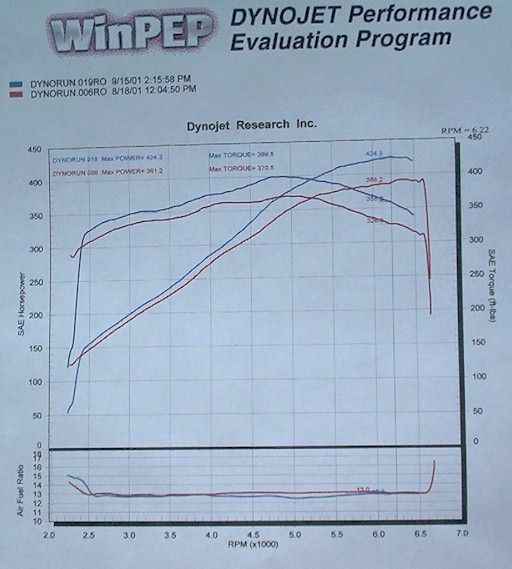 This makes the overall project gains from the very first best dyno pull of 288 RWHP/300 RWTQ a whopping +136 RWHP and +100 RWTQ on a stock shortblock!!! I'm impressed! I will be off to the track (weather permitting the first week of October). I hate to make you wait for the results but you're just going to have to come back one more time next month!